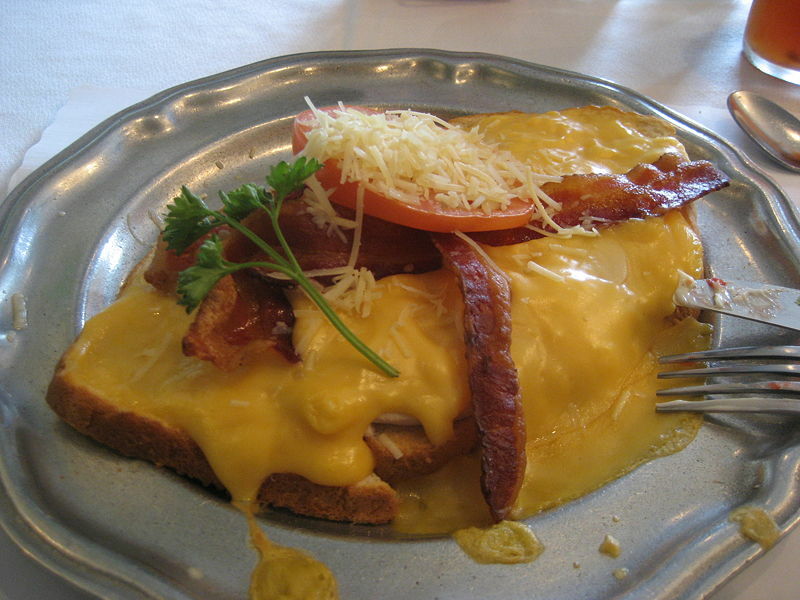 A Hot Brown is a hot sandwich originally created at the Brown Hotel in Louisville, Kentucky, by Fred K. Schmidt in 1926. It was created to serve as an alternative to ham and egg late-night suppers. Left: One version of the Hot Brown featuring shredded Parmesan cheese, melted American cheese, and tomatoes. The Hot Brown is an open-faced sandwich of turkey and bacon, covered in Mornay sauce and baked or broiled until the bread is crisp and the sauce begins to brown. Many Hot Browns also include ham with the turkey, and either pimentos or tomatoes over the sauce, and imitation Hot Browns sometimes substitute a commercial cheese sauce instead of the Mornay sauce, but fans of the dish usually decry this substitution. Some restaurants even offer a 'veggie brown' nowadays to attract vegetarians, as the recipe is easy to modify with avocado, or, less commonly, soy burger. More common alternatives to the Hot Brown include using Cheddar cheese or American cheese for the sauce. Alternatives for garnishes include tomatoes, mushroom slices, and, very rarely, canned peaches.